Barcelona, ​​2014 – four well-known musicians from the rockabilly scene decided to return to the genre the original features that have been lost over several decades. 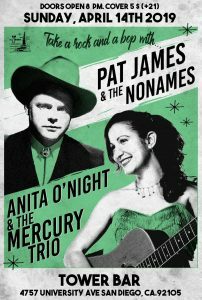 With the firm intentions of creating musicality, dancing and fun, Anita O’Night and The Mercury Trio is born. Anita, Xavi, Pedro and Fran focus their efforts on getting a repertoire of mainly original songs that sound cool and classic at the same time. The band is characterized by an electrifying sound that distills 1950s Rock ‘n’ Roll, Rockabilly, Country and Hot Jazz. 1956 style Bop with the purest style of Cliff Gallup is fronted by the heartbreaking vocal of Anita’s whose voice evokes not only the rockabilly style of Janis Martin, but also other queens of the genre such as Charline Arthur and Sparkle Moore. The Tower Bar updated their cover photo.